Meet me at the Blow Dry Bar! We had just finished working with Megan on her wedding suite (coming soon! 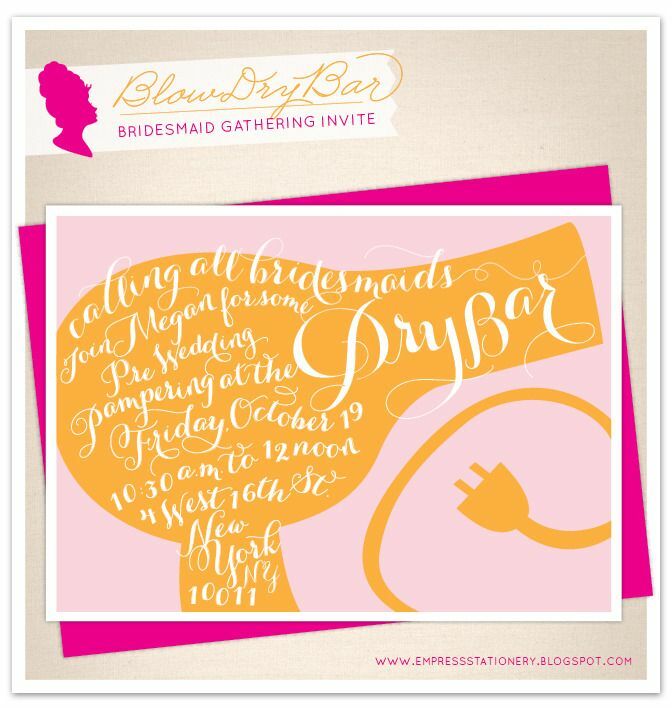 )when she asked us to design an invitation she could send her bridesmaids for a beauty day at the blow dry bar. For those of you that are unfamiliar to the new boutique-like approach for hair styling, Blow Dry bars are all the rage! We have one here in Birmingham, where they offer everything from styling for special events to what I call a "feel good" days (get your nails done, hair cut/highlighted, and blown out). All the while, you get to watch fun girly movies (i.e. Mean Girls, Clueless, AHHH! )and sip champagne! If you can't tell, I was thrilled to design this invite. I think it work well for birthday parties too! For inquiries, email us at sarah.s.empress@gmail.com.